No, it's a Clafoutis (kla-FOO-tee)... a traditional French dessert that lives at the intersection of Custard, Bread Pudding, Soufflé and Pancakes. If you love any of those items, then you're sure to enjoy this! Typically made with Black Cherries, a Clafoutis is a rustic dish, which is culinary code for "flavor over form"... "substance over style". It also means that there are no strict rules for execution. Escoffier isn't keeping score. This is a country farm dish. Cows need milking. There's no time to be fussy! While a baked Custard, such as a Crème Brûlée, is made with just Eggs, Milk, Cream and Sugar, a Clafoutis also includes Flour. The addition of Flour makes for a slightly bready consistency rather than a silky smooth Custard. But if you do some comparing, you will quickly notice that the amount of Flour varies wildly across recipes. Back in culinary school, our recipe called for virtually no Flour, and the end product was effectively a Fruit-filled, baked Custard. Julia Child's recipe, which seems to have brought Clafoutis into the American pastry consciousness (although just barely), calls for a more substantive amount of Flour. The result is something more akin to a giant, inflated Crêpe. I've found that my preference lies somewhere in between the Flour-barren and Flour-laden extremes. I'm not looking for a Custard. And I don't want a Cake. Fortunately, simple recipes like this are easily customized, and small adjustments to the ratios of ingredients can be made to suit personal tastes. Start by selecting and preparing your Fruit. 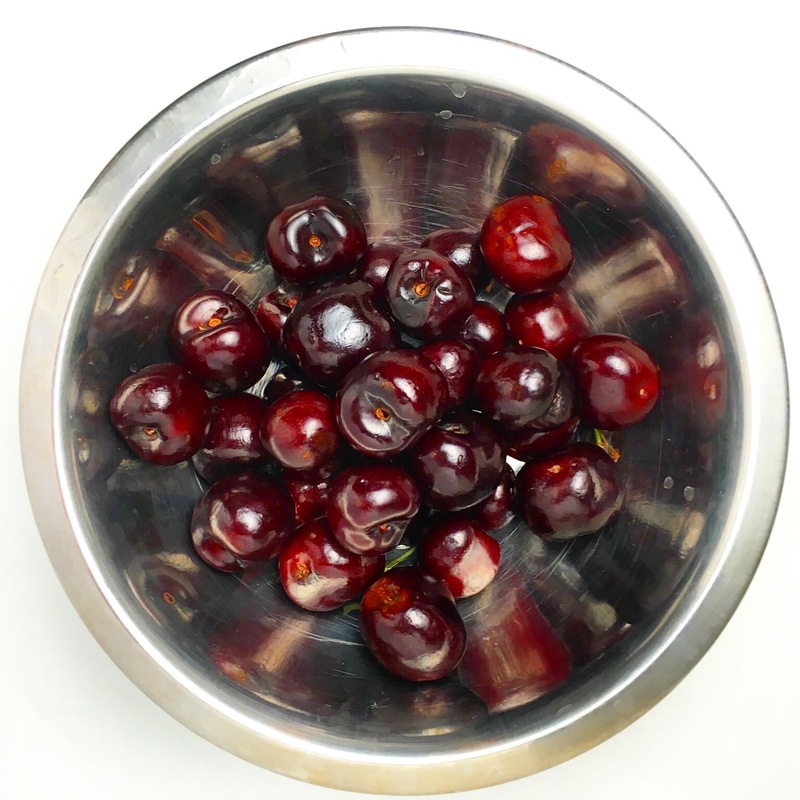 Black Cherries are the traditional garniture for a Clafoutis, but other Stone Fruits, such as Plums and Peaches, are also commonly used. In fact, almost any Fruit is fair game - just avoid anything with a high water content (e.g. Raspberries), which could seep out during baking and prevent the Clafoutis from setting properly. Traditional preparations will actually used unpitted Cherries. While this supposedly brings an Almond flavor to the Clafoutis, that subtle flavor also brings with it a significant risk of chipping a tooth. It's up to you to decide if the risk of dental damage is really worthwhile. I recommended pitting and halving the Cherries. Then set them aside while you prepare the Clafoutis Batter. A Clafoutis can be baked in a wide array of dishes. Regardless of the dish you choose, the Clafoutis Batter should only fill the dish to the depth of about 1.5". Keep that in mind when making your selection. And it should go without saying, but the baking times will vary significantly based on the type of dish used. Whatever dish you finally settle on, prepare it for the Clafoutis by coating it liberally with Butter. The Clafoutis Batter is a simple mixture of Milk, Cream, Sugar, Eggs and Flour. Unlike a Pancake, a Clafoutis uses no chemical leavening (e.g. Baking Soda or Baking Powder). A Clafoutis puffs up in the oven because of the air that gets trapped during the mixing process (i.e. mechanical leavening). But while a little leavening is desirable, this is not a Soufflé. A Clafoutis should not rise up out of the baking dish. 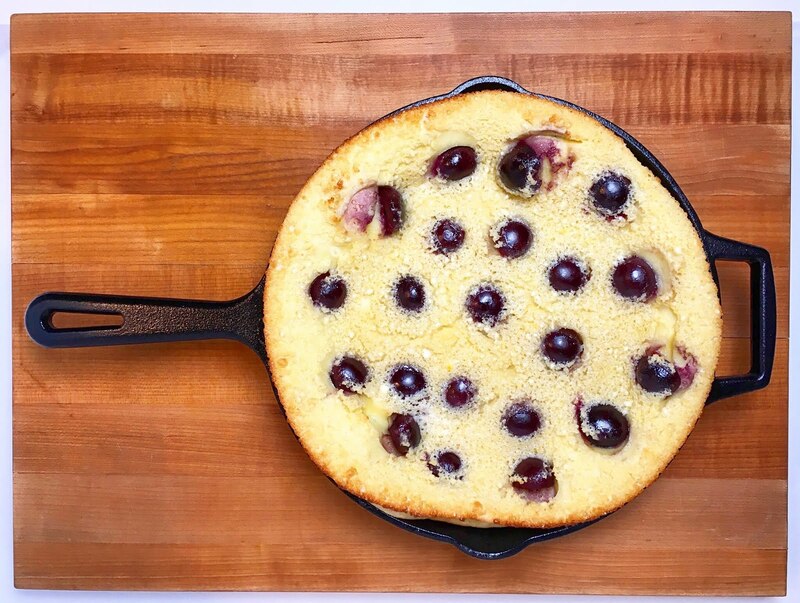 To keep the rise in check, a Clafoutis batter should be gently stirred rather than aggressively whisked. To make the Clafoutis Batter, first combine the Milk, Cream, Sugar (and Vanilla Extract) in a mixing bowl and stir until well combined. Next, in a separate bowl, beat the Eggs with a fork until the Egg Whites and Eggs Yolks are homogeneous. Pour the Egg mixture into the Milk mixture and stir until well combined. Lastly, sift the Flour and Salt into the wet ingredients while whisking gently until the Clafoutis Batter is well combined. While it is important to make sure that the Clafoutis Batter is well mixed, you do not need to whisk it smooth. In fact, over-whisking the Clafoutis Batter much may trap too much air, which will cause the Clafoutis to puff up too much when baked. Do not worry about any small lumps of Flour that may form. They will break down during the baking process. 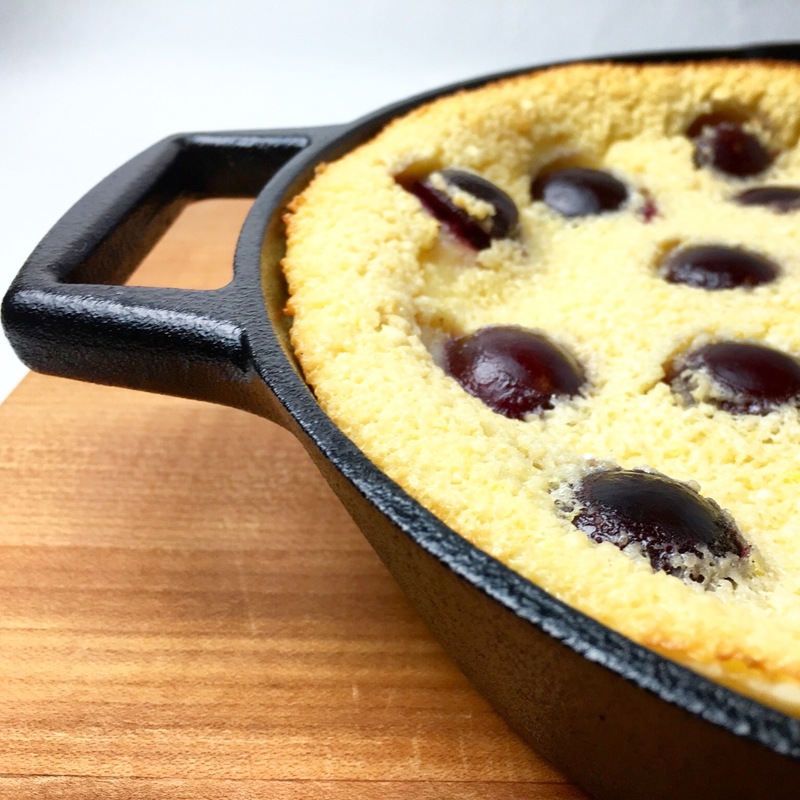 Once the Clafoutis Batter is mixed, pour it into the prepared baking vessel of your choice (individual ramekins, 8"x8" baking dish or 9" skillet). 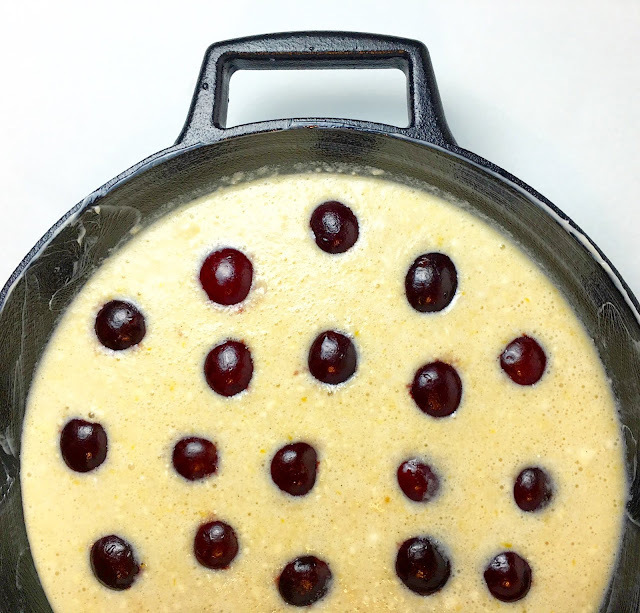 Then, evenly distributed the halved and pitted Cherries on top of the Clafoutis Batter. Bake the Clafoutis at 375 degrees Fahrenheit (191 degrees Celsius) for approximately 40 minutes. The Clafoutis will puff up and brown as it bakes. It is fully baked when it just barely jiggles when gently shaken and a tester inserted in the center removes clean. Do not over-bake the Clafoutis. The soft, just-cooked texture is one of the hallmarks of the dessert. Allow the Clafoutis to cool for approximately 15 minutes before serving. The Clafoutis is best served warm (says me! ), but it can also be served at room temperature or chilled - it's all a matter of personal taste. While the Clafoutis is undeniable best served the day it is made, it can be stored for a day in the refrigerator in an airtight container. A Clafoutis should not be frozen - don't even try! 1. Preheat the oven to 375 degrees Fahrenheit (191 degrees Celsius). 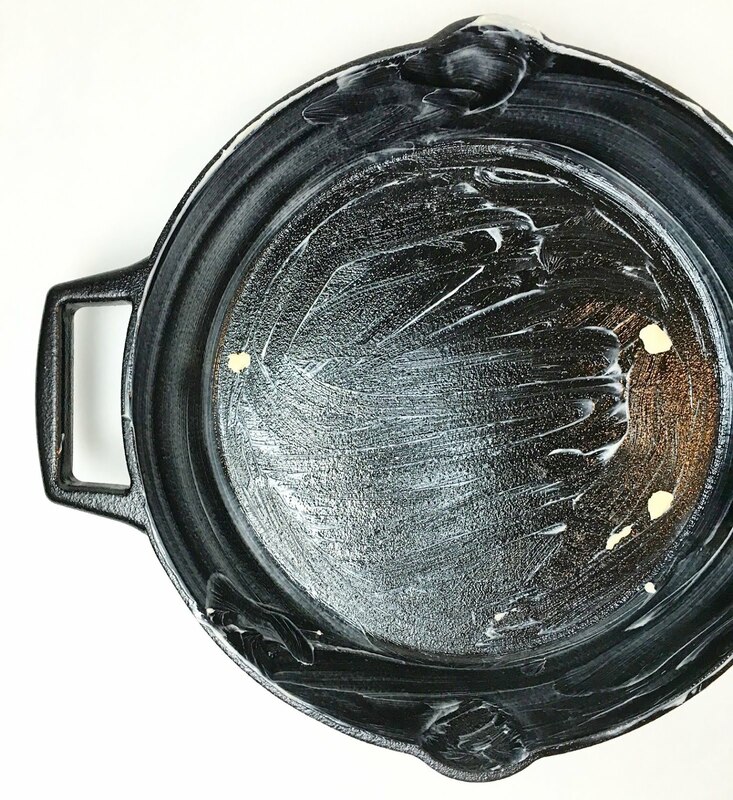 Prepare a 9" cast-iron skillet or 8"x8" baking pan by coating it well in Butter. Wash, halve and pit the Cherries. 2. In a large mixing bowl, stir together the Milk, Cream, Sugar and Vanilla Extract. In a separate bowl, beat the Eggs until the Egg Whites and Egg Yolks are completely homogeneous. Pour the Eggs into the Milk mixture and stir until well combined. Chef's Note: Although it is okay to use a whisk, do not actively whip air into the Clafoutis Batter. The more air that is trapped in the batter, the more the Clafoutis will rise in the oven. A properly baked Clafoutis should rise somewhat, but it should not inflate like a Soufflé. 3. Sift the Flour and Salt over the Egg and Milk mixture while stirring. Stir the mixture until it is well combined into a smooth Clafoutis Batter. Chef's Note: It is okay to have some small lumps of Flour in the Clafoutis Batter. They will break down during the baking process. 4. 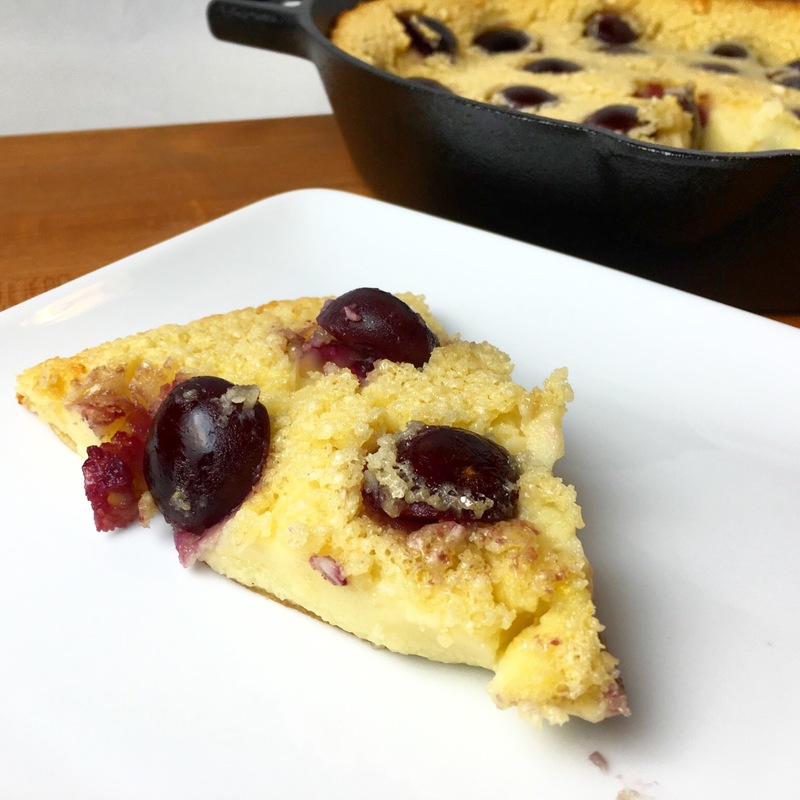 Pour the Clafoutis Batter into the prepared skillet or baking pan. 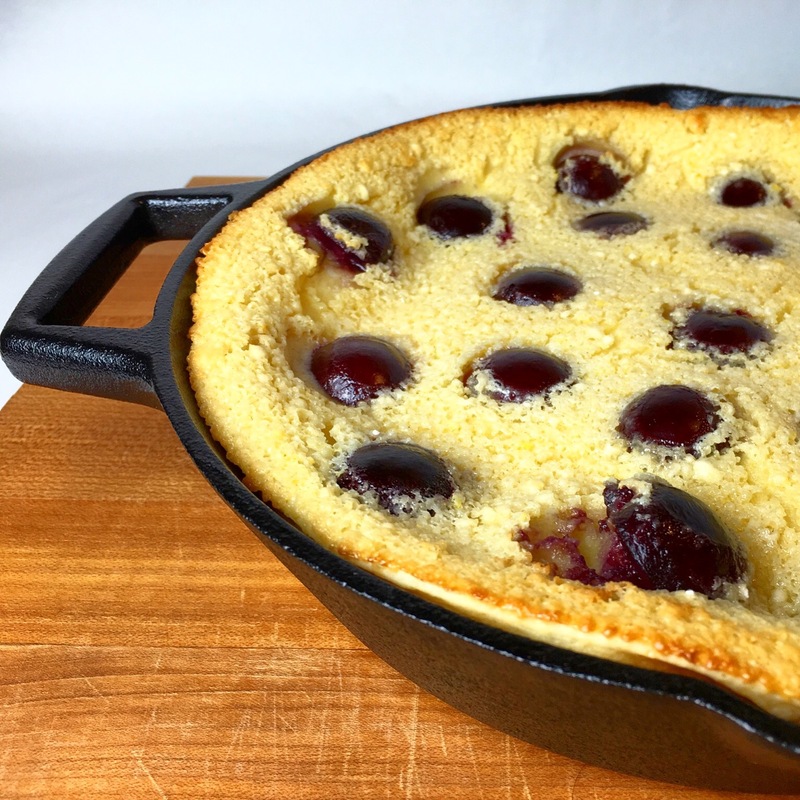 Evenly distribute the pitted Cherries across the top of the Clafoutis Batter. 5. Bake the Clafoutis for approximately 40 minutes. The Clafoutis is done when it has puffed up, turned lightly browned on top and a tester inserted in the center removes clean. 6. Allow the Clafoutis to cool for approximately 15 minutes before serving. The Clafoutis can be served warm, at room temperature or even chilled from the refrigerator. - The Clafoutis is best served the day it is made, but it can stored for up to 24 hours in an airtight container in the refrigerator. - Do not freeze a Clafoutis. 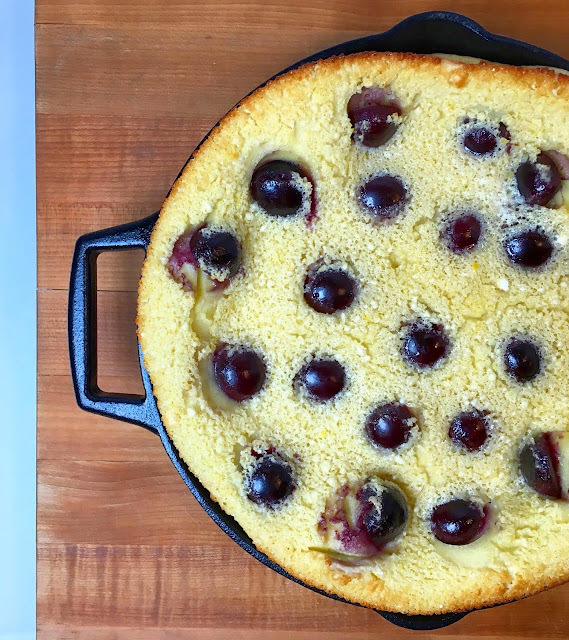 Cherry Clafoutis looking so awesome.Who would not like such colorful recipes?Absolutely no one. Your blog is honestly so carving.I would like to try it.Thank you very much.